JPQL is a powerful query language that allows you to define database queries based on your entity model. Its structure and syntax are very similar to SQL. But there is an important difference that I want to point out before I walk you through the different parts of a JPQL query. JPQL uses the entity object model instead of database tables to define a query. That makes it very comfortable for us Java developers, but you have to keep in mind that the database still uses SQL. Hibernate, or any other JPA implementation, has to transform the JPQL query into SQL. It is, therefore, a good practice to activate the logging of the SQL statements during development to check the generated SQL statements. Before we dive into the details of JPQL, let’s have a quick look at the entity model I use for all examples. It consists of an Author who has written one or more Publications. A Publication can be a Book or a BlogPost. A Book might have been published by one Publisher. The FROM clause defines from which entities the data gets selected. Hibernate, or any other JPA implementation, maps the entities to the according database tables. The syntax of a JPQL FROM clause is similar to SQL but uses the entity model instead of table or column names. The following code snippet shows a simple JPQL query in which I select all Author entities. As you can see, I reference the Author entity instead of the author table and assign the identification variable a to it. The identification variable is often called alias and is similar to a variable in your Java code. It is used in all other parts of the query to reference this entity. If you want to select data from more than one entity, e.g., all authors and the books they’ve written, you have to join the entities in the FROM clause. The easiest way to do that is to use the defined associations of an entity like in the following code snippet. The definition of the Author entity provides all information Hibernate needs to join it to the Book entity, and you don’t have to provide an additional ON statement. In this example, Hibernate uses the primary keys of the Author and Book entity to join them via the association table of the many-to-many association. JOINs of unrelated entities are not supported by the JPA specification, but you can use a theta join which creates a cartesian product and restricts it in the WHERE clause to the records with matching foreign and primary keys. I use this approach in the following example to join the Book with the Publisher entities. 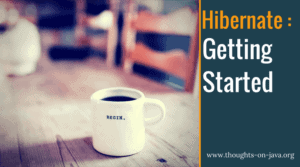 You can read more about this workaround and Hibernates proprietary support for JOINs of unrelated entities in How to join unrelated entities with JPA and Hibernate. INNER JOINs, like the one in the previous example, require that the selected entities fulfill the join condition. The query returned only the Author entities with associated Book entities but not the ones for which the database doesn’t contain a Book entity. If you want to include the authors without published books, you have to use a LEFT JOIN, like in the following code snippet. The previous examples use the defined association to join the entities. But sometimes you only want to join the related entities which fulfill additional conditions. Since JPA 2.1, you can do this for INNER JOINs, and LEFT JOINs with an additional ON statement. Path expressions create implicit joins and are one of the benefits provided by the entity model. You can use the ‘.’ operator to navigate to related entities as I do in the following code snippet. As you can see, I use the ‘.’ operator to navigate via the publisher attribute of the Book entity b to the related Publisher entities. That creates an implicit join between the Book and Publisher entity which will be translated into an additional join statement in the SQL query. When you choose an inheritance strategy that supports polymorphic queries, your query selects all instances of the specified class and its subclasses. With the model in the example for this blog post, you can, for example, select all Publication entities, which are either Book or BlogPost entities. Or you can select a specific subtype of a Publication, like a BlogPost. Since JPA 2.1, you can also use the TREAT operator for downcasting in FROM and WHERE clauses. I use that in the following code snippet to select all Author entities with their related Book entities. As you can see in the model, the publications association defines an association between the Author and the Publication entity. So without the TREAT operator, the query would return all Author entities with their associated Book or BlogPost entities. ATTENTION: There are several issues with the implementation of TREAT in Hibernate 5.1. Based on my experiments, Hibernate 5.1 handles TREAT only, if it is written in lower case and used in the WHERE clause. The treat operator in this example is ignored by Hibernate 5.1.0.Final. The next important part of a JPQL query is the WHERE clause which you can use to restrict the selected entities to the ones you need for your use case. The syntax is very similar to SQL, but JPQL supports only a small subset of the SQL features. If you need more sophisticated features for your query, you can use a native SQL query. JPQL supports a set of basic operators to define comparison expressions. Most of them are identical to the comparison operators supported by SQL, and you can combine them with the logical operators AND, OR and NOT into more complex expressions. The % character represents any character sequence. This example restricts the query result to all Authors with a firstName that contains the String ‘and’, like Alexander or Sandra. You can use an _ instead of % as a single character wildcard. You can also negate the operator with NOT to exclude all Authors with a matching firstName. You can negate the operator with NOT to restrict the query result to all Authors who’s firstName IS NOT NULL. Restricts the query result to all Authors with the first name John or Jane. Restricts the query result to all Authors that don’t have any associated Book entities. You can negate the operator (IS NOT EMPTY) to restrict the query result to all Authors with associated Book entities. Restricts the query result to all Authors who are associated with more than 2 Book entities. Restricts the query result to all Authors who are associated with a specific Book entity. You can use one or more of the operators to restrict your query result. The following query returns all Author entities with a firstName attribute that contains the String “and” and an id attribute greater or equal 20 and who have written at least 5 books. The projection of your query defines which information you want to retrieve from the database. This part of the query is very different from SQL. In SQL, you specify a set of database columns and functions as your projection. You can do the same in JPQL by selecting a set of entity attributes or functions as scalar values, but you can also define entities or constructor calls as your projection. Hibernate, or any other JPA implementation, maps this information to a set of database columns and function calls to define the projection of the generated SQL statement. Let’s have a look at the different options. You can use any combination of them in your queries. Entities are the most common projection in JPQL queries. Hibernate uses the mapping information of the selected entities to determine the database columns it has to retrieve from the database. It then maps each row of the result set to the selected entities. It’s comfortable to use entities as your projection. But you should always keep in mind that all entities are managed by the persistence context which creates overhead for read-only use cases. In these situations, it’s better to use scalar values or a constructor reference as a projection. Scalar value projections are very similar to the projections you know from SQL. Instead of database columns, you select one or more entity attributes or the return value of a function call with your query. Constructor references are a good projection for read-only use cases. They’re more comfortable to use than scalar value projections and avoid the overhead of managed entities. JPQL allows you to define a constructor call in the SELECT clause. You can see an example of it in the following code snippet. You just need to provide the fully qualified class name and specify the constructor parameters of an existing constructor. Similar to the entity projection, Hibernate generates an SQL query which returns the required database columns and uses the constructor reference to instantiate a new object for each record in the result set. You probably know SQL’s DISTINCT operator which removes duplicates from a projection. JPQL supports this operator as well. When you use aggregate functions, like count(), in your SELECT clause, you need to reference all entity attributes that are not part of the function in the GROUP BY clause. The following code snippet shows an example that uses the aggregate function count() to count how often each last name occurs in the Author table. The HAVING clause is similar to the WHERE clause and allows you to define additional restrictions for your query. The main difference is that the restrictions specified in a HAVING clause are applied to a group and not to a row. I use it in the following example to select all last names that start with a ‘B’ and count how often each of them occurs in the Author table. You can define the order in which the database shall return your query results with an ORDER BY clause. Its definition in JPQL is similar to SQL. You can provide one or more entity attributes to the ORDER BY clause and specify an ascending (ASC) or a descending (DESC) order. The following query selects all Author entities from the database in the ascending order of their lastName attributes. All Authors with the same lastName are returned in descending order of their firstName. A subselect is a query embedded into another query. It’s a powerful feature you probably know from SQL. Unfortunately, JPQL supports it only in the WHERE clause and not in the SELECT or FROM clause. Subqueries can return one or multiple records and can use the aliases defined in the outer query. The following example shows a query that uses a subquery to count all Books written by an Author and returns only the Authors who’ve written more than 1 Book. As you’ve seen, the syntax and structure of JPQL are pretty similar to SQL. This makes JPQL easy to learn when you’re already familiar with SQL. But you have to keep in mind that SQL supports a lot of advanced features that you can’t use with JPQL. If you need one or more of them for a specific use case, you should use a native SQL query. Nice article. After getting appalling performance using purely “criteria-type” queries, I replaced with targeted JPQL and reduced query time by 70%. I could reduce it much more, I’m sure with native queries but it would take a lot more coding and potentially damage the object model. With JPQL I brought the query time down to acceptable with very little code modification. It would be nice if Hibernate’s JPQL could produce a better native select with sub-joins instead of sub-queries though. Unless I am missing something this doesn’t seem to be possible. Do you want to use sub-joins to retrieve associated entities? You can do that with a JOIN FETCH clause or an EntityGraph. You can learn more about both options in 5 ways to initialize lazy associations. And I was told that the queries generated by Hibernate 6 will be much better than the current ones. Excellent article. Came here because of the Order by and Group by ‘clauses’. However, would be nice if this article had a date so we could know how up-to-date it is and what version of JPA or Hibernate it references. I’m constantly updating my articles to keep them up to date. So, the publishing date of an article isn’t really relevant. The ORDER BY and GROUP BY clauses are have been supported since the beginning and haven’t changed for years. So, you can be sure that you can use the things that you learned in this article. From Hibernate >4.2 onwards I see JPQL queries can’t have alias name same as Entity, throwing up below error. Could you explain what exactly is changed with newer version of JPA 2.1? that works perfectly fine with Hibernate 5.3 and 5.4. Maybe it’s a bug in older Hibernate versions?